Sunday was Purim, a little bit crazy, but fun, and while we had a bit of sugar overload, I'm pleased to say we avoided the majority of the processed junk. So we'll start the plan with Monday! Thursday: Lunch: baked potatoes with various toppings, ??? 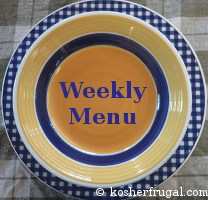 What's on your menu this week? How far in advance do you plan your meals?